We’d love your help. Let us know what’s wrong with this preview of Dawn of a Legend by R.K. Lander. To ask other readers questions about Dawn of a Legend, please sign up. Dawn of a legend is as fast paced and amazing as the first two in the silven series. The characters and the world R.K has created is enchanting, friendships forged, the company, battles fought side by side, I couldn't put the book down until i lived the last word, then let my imagination take me away, for what comes next, for Fel'annar and his friends. Definitely a series I will read again and again. RK Lander in book 3 Dawn of a Legend continues to build a world rich in its surroundings and more so with the continued development of the central characters. This story and her books have touched me on an emotional level. She makes me believe I am there with Fel’annar and the company as they continue there adventures and their own personal growth. To walk their path with them is amazing. I have no idea how she does it but I hope the Story never ends! 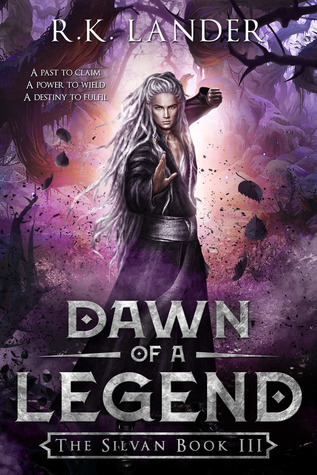 Dawn of a Legend is the third, and - in my opinion - the best book in this series so far. Each character has depth and potential for growth, which many of them do. R.K.'s descriptive style allows me to visualize every scene as if I were there, and the visual details only serve to enhance the story rather than distracting from it. In this book, the political machinations and intrigue continue, while a new enemy is introduced. The mystery around the nature and identity of that enemy escalates continuously until the epic battle towards the end. I thoroughly enjoyed watching Fel'annar's continued evolution as a warrior, and was thrilled by the addition of the internal martial arts. I haven't found that as much as the external marital arts in the fantasy and UF genres (maybe I'm reading the wrong books? ), but as a practitioner, I love its role in this story. Perhaps more important are the emotional changes that several characters go through. It's almost a given that Fel'annar, as the young, main protagonist, would experience more emotional growth, but I especially enjoyed how much some of the older characters are changed as well. I found myself tearing up during some of the scenes, laughing out loud at others (The Company never fails to entertain! ), and reading with bated breath during and after the final battle. It was hard to put the book down. The best book so far in this exceptional series. An absolute must-read! A worthy successor to the first two Silvan books from R. K. Lander. Good character development and advances the story nicely, setting it up for the fourth book, due next year. Can't wait! "Her gaze briefly crossed with his strangely glowing eyes, his hair that seemed to move too slowly for the lunging strides he took. This was no longer Fel’annár, The Silvan. This was a force of nature." Where to begin? Things continue to change and evolve in this third installment of the series and it has left me with mixed feelings. Did I enjoy it? Of course. What has it left me with? I couldn't say. Having just finished the book, I don't really know how it has made me feel. So, since I am unabl "Her gaze briefly crossed with his strangely glowing eyes, his hair that seemed to move too slowly for the lunging strides he took. This was no longer Fel’annár, The Silvan. This was a force of nature." Where to begin? Things continue to change and evolve in this third installment of the series and it has left me with mixed feelings. Did I enjoy it? Of course. What has it left me with? I couldn't say. Having just finished the book, I don't really know how it has made me feel. So, since I am unable to name an emotion, let me first start with what I loved. "Handir was a prince and Fel’annár was a warrior; there was nothing else between them except for a sad story." This is the first hint of a changing relationship although I will not reveal in what direction this goes ... but I loved it! Dawn of a Legend is certainly longer than the previous two which is much more befitting of epic fantasy. Fel’annár's abilities and skills continue to develop and he faces heart-stopping danger. "A green wisp, like a gauzy green banner, and he followed it, summersaulting forwards as yet more arrows rained down on him, but they missed"
Meanwhile, the situation between the Alpines and Silvans escalates and the Alpine King and crown prince Rinon hold the Forest Summit mentioned at the end of the second book. The king's uncle brings his schemes to a head and everything is set to climax in no doubt a very thrilling fourth book. "Their subjugation had come to an end. Their debasement and their humiliation would vanish into a shameful past." However, not everything sat right with me in this book. The romance for me was badly timed and difficult to empathise with at times. I also found it dominated over Fel’annár's bond with The Company, which in previous books has been the focal point of the story; a group of brothers that would do anything for each other. However, in Dawn of a Legend, I felt that The Company became somewhat two dimensional. I no longer felt that they were an integral part of the story and were merely ornamental. Before you protest, I know they were involved in some pretty important moments, but the true, heartfelt dialogue and shared understanding were missing. It's as though, now that we've reached a certain point in the story, they no longer need to be recognised. Also, while the book is longer, it still doesn't cover a very long period of time and the protagonist's training is not given much opportunity, something that may or may not be deliberate. I was hoping to see some development with the deviants, and while there was, it wasn't in the direction I had hoped. They are painted in black and white with no room for grey and only a small advance in intelligence, which makes it feel more like a game with a powerful boss fight at the end of it. I also felt the plot was a bit divided between the deviants and the threat of civil war and I felt a bit unclear as to where the book was trying to go. I hope that this will be cleared up in the fourth book. However, despite all that, the book was still highly enjoyable and thoroughly above the standard of the average book. I loved how Fel’annár was so much more relatable. No longer invulnerable or perfect and now a person who has made his legend through his own hard work and merits. This was a significant improvement and I'm so glad it happened. Last of all, thank you to the author, R.K. Lander for your hard work in bringing us yet another book. And to those of you who have yet to read this book, if you liked the previous installments, I don't see that you wouldn't enjoy this one also. The fourth book additionally promises to be a fascinating read ... with a lot at stake. I am one of the biggest elf geeks I have ever met. First inspired by the world of Tolkien, I began writing short stories, until the idea of the Silvan popped into my head. That was no short story but a sprawling 900 pages of epic fantasy. The Silvan is my first publshed work, a YA epic fantasy trilogy revolving around the figure of a Silvan elf, Fel'annar. The first in the series, Path of a Novice I am one of the biggest elf geeks I have ever met. First inspired by the world of Tolkien, I began writing short stories, until the idea of the Silvan popped into my head. That was no short story but a sprawling 900 pages of epic fantasy. The Silvan is my first publshed work, a YA epic fantasy trilogy revolving around the figure of a Silvan elf, Fel'annar. The first in the series, Path of a Novice Is now available and the second, Road of a Warrior, is approaching the editing stage.